It is entirely possible to go through an entire day of customer service interactions and never encounter a human being. In the morning, I need gas. I go directly to the pump, swipe my card, and complete the entire transaction. I go to the ATM to check my balance and withdraw some cash. Later in the day, I'll call the 1-800 number and use the automated system to make sure a specific transaction has cleared. I got turned around trying to find an address. I didn't pull over and ask a gas station attendant, I pulled over and pulled out my GPS. That evening, I'll pay a few bills on line. I have a question about a cable service, so I log into my account, and check the FAQ section to find my answer. I need to buy some clothes and a few books. I won't bother going to the store, I can do it all online. Since we do so much without human contact, it's important that we remember to be human when we talk to an actual human. Many of the more mundane and common interactions can be handled through some sort of automated phone tree or simple online service. Yet when I encounter a problem, those automated services cannot help me, in fact, they can be downright infuriating. So when I finally get through to a person, it helps if they can give me something the automated services can't: empathy, understanding and help with a difficult problem. In a world of automation, the human touch cannot be replicated, no matter how 'human' they try to make the automated voice sound. Only a human can be a human and that can make all of the difference in delivering a positive customer service experience. This article by Elizabeth Montalbano is reprinted from Information Week, October 28th. New online services from the IRS and the State Department are among those in the works to meet a new federal mandate to improve federal customer-service engagements. In April the White House by executive order required federal agencies to develop plans to identify steps they would take to improve customer service. This week agencies are posting their plans online, according to a White House blog post by Federal Chief Performance Officer Jeffrey Zients. Specifically, the plans are supposed to show how agencies will adopt best practices from the private sector, develop service standards and track performance against them, and benchmark themselves against the private sector to improve customers' experience. The plans also were required to include a so-called "signature initiative" that specifically leverages technology to achieve goals. The feds' plan to use the Web more to help customers comes at a good time, as a recent study found that people increasingly are using this channel to communicate with the government. To that end, Zients highlighted new technology investments the IRS, State Department, and Department of Health and Human Services will make to bolster online engagement with customers. The IRS is developing an app for its website that will let taxpayers securely authenticate their identity online and then send transcripts of tax records to an authorized third party. Currently, people can request these transcripts online but can only receive them through the mail. Millions of people annually make these requests, and the new app will expedite their fulfillment, according to Zients. The State Department aims to simplify another bureaucratic process for Americans as part of its customer service plan—applying for a passport card, which will be valid for travel to Canada, Mexico, the Caribbean, and Bermuda. The department is developing a pilot so people who already have a valid U.S. passport book can apply for a passport card online by uploading a digital photo and making an online payment. The pilot is experimenting with electronic signatures to see if they are viable for this type of passport processing, which the department does more than a million times a year. For its part, HHS will launch an online service for small businesses that helps them identify insurance plans to offer employees. Through HealthCare.gov’s Insurance Plan Finder, small business owners will be able to see benefit and cost-sharing information for insurance plans in their local areas and basic pricing comparisons between the plans. One of the hallmarks of good customer service is to be able to handle a problem quickly and efficiently. No customer wants to be on hold forever or have to make several calls to get their issues handled. However, they don’t want to be rushed off the phone or brushed off either. There is a fine line between fast and efficient and rude and brusque. 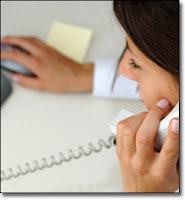 Organization goes a long way in making calls go faster and more smoothly. Most of the time, you are dealing with different people who have the same questions and concerns. Develop a cheat sheet with answers to the most common questions or instructions on the processes you use to find those answers. Of course, there are exceptions, but the majority of people are calling with the same concerns so be prepared with the answers to those questions. A little courtesy will make the caller feel acknowledged and respected. You don’t have to have long drawn-out conversations or make endless small talk, but being polite and even pleasant can make the caller feel valued. Those little things really do mean a lot. Take time to listen. True, you might know exactly what they are going to say or ask for but still give them the time to ask it. No one likes to be cut off mid-sentence or to feel as if they aren’t being heard. While they are talking, you could start finding the answer to their question or getting the information they need but never be short with people. Fast, courteous service is the key to a satisfied customer! It used to be that customers relied on word-of-mouth to share their customer service experiences (good and bad). If it was really good or bad, a small segment of the population would sit down and write a letter. 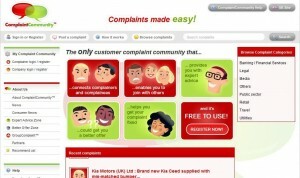 Nowadays it’s easy for customers to share their experiences and they are sharing! From choosing an apartment to finding a washing machine repair to investigating my mortgage company, there are a number of sites, message boards and forums, devoted to chronicling the customer experience. Human nature says that people will share a bad experience much more often than they will a good one and that fact is backed up when I look at many customer-fueled sites. However, when reviewing customer responses, I keep a few things in mind. Many negative reviewers are unnecessarily harsh. They blow one aspect of an overall good experience way out of proportion. I’ve read 2-star restaurant reviews that complain about slow service even though later in the review they reveal that food was good and the meal was comped. The anger comes from the fact that the whole bill wasn’t comped! I’m also looking for a little balance. I’m concerned when there are no good reviews or experiences at all. I’m also weary when out of a litany of bad reviews, there are sparkling five-star reviews that acknowledge no imperfections or even hint at the slightest problem. Those are usually written by staff! I also look for balance within a review. When a bad review acknowledges that at least the staff was friendly or the room was clean, is more likely to be accurate. Normally, there is a little good with the bad. Details help as well. I had a horrible experience attempting to refinance my mortgage. When I went on line, I was shocked at what I found. There were several sites devoted to the horror this company had caused others. What was shocking was their level of detail … and the fact that the details of their experience mirrored mine! Blogs, message boards, Facebook fan pages, Twitter, bad service gets out now faster than ever … and it isn’t always fair or accurate but it’s out there. Every customer contact has the ability to live in perpetuity in the Internet. Keep that in mind as you engage your customer. It's sad but when I receive great customer service, I really am surprised. The latest incident was at Banfield, the Pet Hospital of all places. My 12-year old toy poodle, Marty, suffers from a chronic condition called Cushing's disease. He was diagnosed several years ago and has had to take some expensive medicine for the past few years (and for the rest of his life). He's also had to be subjected to some all day testing (that isn't cheap either). We've had several vets since his diagnosis. The first one was great and we've suffered through everything from pretty good to downright dreadful since then. Anyway, I took him in for some standard vaccines. Because I had to work, I dropped him off in the morning and planned to pick him up that evening. I got nervous around 10:30 when I got a call from the pet hospital. I was immediately nervous - what was wrong with Marty? I mean, why would they call unless there was a problem, right? Wrong. It was a new vet and she was calling to introduce herself to me. Over the next 10 minutes, we reviewed Marty's diagnosis and she gave me some information I'd never known about Cushings. She told me when his next test would be scheduled and even how I could save some money on the expensive blood work. She was pleasant and personable and clearly knowledgeable. I feel completely comfortable knowing that this doctor is in charge of my dog's care. A lot of times, we focus on customer service being the responsiblity of the front line personnel ... customer service representatives, receptionists and sales clerks. Yet, this experience proves that good customer service isn't restricted to hourly employees who have a first contact with the customers. Professionals ... vets, doctors, lawyers, even teachers, have an important role to play when it comes to customer service and how well they meet that responsibilty can be the difference between a repeat customer and one who takes their business elsewhere! Chances are you are part of a team of CSRs. Maintaining a positive dynamic to that team is critical to your success. Throughout the day, you depend on each other, help each other with problems, and cover for each other. 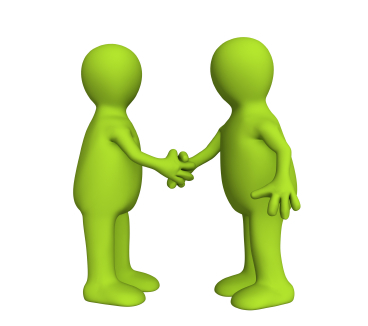 Unlike the brief interaction with a customer, this is a long-term relationship. You spend more time with your co-workers than you do with your family! So it makes sense to give these relationships some of the proper care and feeding that you would any other relationship. And in the work world, nothing erodes trust and teamwork faster than gossip. There is a famous quote attributed to Eleanor Roosevelt that says, “Small minds talk about people; mediocre minds talk about events; great minds talk about ideas." I’ll take that a step further. Truly small minds talk about people and events they know. A gossip talks about the people closest too them. They betray trusts by repeating things said in confidence. 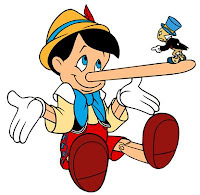 They grind the rumor mill by spreading half-truths and sometimes outright lies. They instigate and promote division. Clearly, this person is a burden for the team to carry. If you are dealing with a gossip, take a cue from the zoo and “Don’t Feed the Animals.” If you gossip with them or even just listen, you are contributing to the problem. If you can, excuse yourself or subtly try to change the conversation. 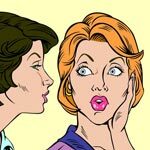 If they try to engage you in gossip, respond with an “I don’t know anything about that,” or an “I don’t know what to say about that one!” Engaging in conversation with the gossip or even just nodding in response, gives the gossip the go-ahead to continue. Either end the conversation or change the subject. If you are the gossip, realize that though you may enjoy your role as Public Information Officer #1, you are doing damage, even if you don’t see it. Trust me; just like you are talking about people, they’re probably talking about you. If you absolutely must talk, keep it at a higher level. Refrain from talking about co-workers and even your personal life to an extent. Talk about issues, talk about TV, movies, or celebrities (always a good source for gossip). The rule for gossip is if someone is so willing to discuss someone else’s business, they’re probably willing to discuss yours too. Yes, loose lips sink ships but more importantly they destroy teams. This weekend, I attended the Southern Women’s Show for the first time. It was great! There were speakers, fashion shows, cooking demos and a ton of booths and deals to be had. As my friends and I moved from booth to booth, we came across one that sold a steamer that worked better than an iron. As we watched the demo, it easily removed wrinkles from a variety of fabrics – but that wasn’t all! There was an attachment that allowed the steam iron to be used for a steaming facial. Beautifully wrinkle-free clothes and a beautiful face, who could ask for more? One of my friends was sold. As she pulled out her credit card, another woman approached the demonstrator. She pulled out her steam iron and announced rather abruptly that it did not work. My friend kept her credit card in hand. The demonstrator didn’t bat an eyelash. She didn’t get annoyed. She didn’t get flustered. She didn’t show any frustration or aggravation. She began removing the ‘defective’ iron from the box. She said with confidence that she’d been with the company for eight years and a defective iron was rare. However, if it was actually defective, she’d replace it immediately. As she filled it with water, all of us stood there waiting to see what happened. After it was filled with water, we waited. She continued to talk about the product and why some people encounter problems. She also threw in a few more selling points in the process. Finally, she brought out another wrinkled shirt and using the ‘defective’ iron, she easily removed the wrinkles. The woman with the problem was pleased. My friend handed over her credit card and made the purchase. At no time were there any elevated emotions, hurt feelings or bruised egos. 1. She had confidence in her product. She was sure, right out of the gate, that the product was not defective. 2. She knew common complaints or issues with the product. As she spoke to us, she asked the dissatisfied customer if she had changed the type of water used or how much water she used. Finally, she asked how long she had waited for the product to warm up. It turns out that she had not waited the requisite period of time for the iron to heat up. 3. She remained upbeat. She did not allow the disgruntled customer to shake her demeanor. 4. She quickly gave two alternatives: either it would work or she would immediately replace it. In the end, the dissatisfied customer was satisfied and the new customer (my friend) was even more excited about making her purchase. I call that a win-win and win! You Don’t Have to Take It! Abusive customers are the ones who make a CSR’s job truly difficult. They’ve crossed the line from just angry to inappropriate and abusive. They may even curse, threaten or become crude, but wait a minute. You don’t have to take that. Because many customers truly believe that they are always right, a few feel entitled to treat the CSR in a way that is demeaning and abusive. This is not the case and this is never acceptable. If you come across a customer who refuses to calm down and listen and who insists on being rude, crude and disrespectful, you do have rights. Approach them as you would an angry customer, letting them vent, and then providing a solution in a calm and respectful manner. Most will respond favorably but some will continue to escalate their anger and cross the line. If that happens, still being calm, tell them that you want to help them but only if they calm down and refrain from using abusive and threatening language. Let them know that you cannot continue a conversation with someone who insists on using that kind of language and tone. Many times, they start to calm down a bit … but if they don’t. If they continue to rant and rage after you have asked them specifically not to, make a warm transfer to a supervisor. Don’t transfer blindly, but let the caller know you are transferring them to a supervisor then put them on hold, contact the supervisor and let them know exactly what is going on and the demeanor of the caller. Often, knowing that their call has been escalated is enough to make them take it down a notch. If the supervisor is unavailable and the abusive caller shows no sign of stopping, let him know you are happy to help him when he’s calmed down but you cannot work with someone who insists on exhibiting that kind of behavior or using that kind of language. Let them know that you’ll be glad to help him when he’s willing to speak with you in a reasonable manner. Finally don’t just hang up, let him know that you are going to release the call. Callers will exhibit a range of emotions from emotional and upset to angry to frustrated, and that is fine. As a customer service professional, you are trained to handle those difficult callers. But as a professional and as a human being in general, you do not have to be subjected to abusive and threatening behavior. In order to ease you back into your work week after a long weekend, here are some of my favorite customer service quotes. Unfortunately, the mantra that the customer is always right has been ingrained into our subconscious. The truth of the matter is, for a variety of reasons, the customer is sometimes wrong. Customers might have somehow received the wrong information, overlooked the fine print, misinterpreted something, and the list goes on. For whatever reason, they are disappointed, frustrated and sometimes downright angry that things didn’t go the way they anticipated, so what do you do? Even if they are, you don’t say, “You’re wrong.” It is too blatant and too harsh. Apologize for any misunderstanding and offer to clear up the situation. It’s easy, especially when the caller is upset or frustrated, to get upset and frustrated right back, but try not to. Stay on an even keel and try not to let their emotions rub off on you. If you must, put them on hold and count to ten before returning to the call (that’s 10 not 100! LOL!). A lot of times, if you let them vent for a minute, they’ll calm down and become a little more rational. If they have the information partially correct, start with the part that they got right and then move into correcting the wrong part. If they don’t have it right at all, offer them the correct information in a calm and pleasant tone (not at all sarcastic). A lot of people once they understand will acquiesce. However, there are some people who will stick to their demands no matter what has been said. After you have done your best, escalate the call to a manager. Make sure you have covered all of your bases first and use this only as a last resort. Courteous – customer service representatives should be courteous, polite and otherwise pleasant to speak to. Courteous is a simple way to show respect. Understanding – Listening and repeating back what was said is a simple way to show that you understand the customers concerns. Satisfaction – Satisfaction should be the ultimate goal. The customer should hang up or walk away confident that their issues have been addressed and resolved. They should feel satisfied. Time Sensitive – Time is of the essence. Address the customer’s concerns as quickly and completely as possible. Avoid long waits and hold times whenever possible. Organization – Organization helps move the process along smoothly. Keep the items used most often closest to you. Keep any job aids or ‘cheat sheets’ close by so you can access them immediately. Managing the situation – You are in control of the situation. You have the information the customer needs. You have the answer to the problem. You have the ability to control unruly customers. Empathy – Acknowledge how the customer is feeling especially if they are emotional (angry, upset or annoyed). Don’t ignore their emotion and don’t give in to it either, but recognize their feelings. Rapport – Connect and converse (briefly) with the customer. You are dealing with a real person, a little rapport goes a long way in creating excellent customer service. Today's blog post is a reprint of a release from a new report on Customer Service from Consumer Reports. Just how frustrated are Americans with the state of customer service? According to a new Consumer Reports’ survey, 65 percent are “tremendously annoyed” by rude salespeople and 64 percent of respondents said that they had left a store in the previous 12 months because of poor service. This survey is part of a larger investigation on customer service featured in the July issue of Consumer Reports and online at www.ConsumerReports.org. The report names Walmart among the worst in customer service for its retail service in eight out of 21 industries evaluated. Consumer Reports also found that 71 percent of survey respondents were extremely irritated when they couldn’t reach a human on the phone. Sixty-seven percent said they hung up the phone without getting their issue resolved. “There’s a feeling on the part of Americans that companies are deliberately making it difficult for them by burying phone numbers, sidestepping calls and steering customers to online FAQs instead of live human beings,” said Tod Marks, senior project editor for Consumer Reports. While brokerage firms, eyeglass retailers and pharmacies were among the highest-rated industries for service based on several years worth of subscriber-survey data analyzed by Consumer Reports National Research Center, computer tech support, TV, phone and Internet service providers earned some of the lowest scores. In the report, Consumer Reports identifies the best and worst companies and service providers in each of 21 industries. Walmart or Sam’s Club, and sometimes both, were among the worst in eight categories, including retailers for appliances, electronics, cell phones and supermarkets. By comparison, Apple won praise for its retail service for cell phones, computers, computer tech support and electronics. Consumer Reports survey found that when it comes to customer-service problems, one in five people favor the phone. Only 16 percent of Americans prefer to deal with the issue in person. Most of the respondents said that their preferred method of contact depends on the nature of the problem. No matter how consumers choose to get help, Consumer Reports recommends some tips for reaching a live person and achieving favorable results. Bypass automated phone menus. Websites such as dialAHuman.com and getHuman.com list customer-service numbers and tell how to bypass automated prompts to get a real person. Another free service, LucyPhone, helps consumers avoid waiting on hold by allowing them to provide their phone number and the service calls back when a live representative is on the line. Keep a record. When calling customer service, consumers should keep track of the date and time of the call, the name and location of whom (or everyone) they spoke with, how many times they were put on hold and for how long, and the responses received. Having all this information provides a stronger case if there is a need for follow up. Take it to the next level. Consumers who encounter a runaround should tell the agent they are speaking with that they want to “escalate” the status of the complaint. That’s a guaranteed attention grabber and a reason for a quick fix because agents can be criticized for bumping too many problems upstairs. Be persistent. Speak loudly and often. Consumers should post their stories on social-networks sites if necessary. Companies can hide comments on Facebook but not on Twitter. When using Twitter, use hashtag keywords to make them searchable. Proper “netiquette” suggests good manners no matter what the level of annoyance. With more than 7 million print and online subscribers, Consumer Reports is published by Consumers Union, the world’s largest independent, not-for-profit, product-testing organization. To subscribe, consumers can call 1-800-234-1645 or visit www.ConsumerReports.org. They might be angry. They might be frustrated. Then again, they might be overwhelmed. They could burst out into tears! As a Call Center Representative, it's possible, you could run into each and everyone of them depending on the nature of your business. When dealing with the angry, themost important thing is to let them vent and while they are venting take note of their major issues. As the ranting comes to an end, apologize. No it's not your fault. You probably didn't cause the problem. You aren't apologizing for your mistake, you are apologizing for the company. It's business and not personal. Read back to them what you think the problem is. This lets them know they've been heard. Frustrated callers are usually upset because something isn't working the way it's supposed to, because they've been on hold too long or gone through too many menus to reach a human, because they worked on the problem for a good while before they called. Again, an apology goes a long way ... and so does an explanation. If there is a reason for the hold time, if it is a problem that many people encounter, let the caller know. Acknowledging the reason for the frustration can go a long way. Overwhelmed callers have a lot on their plate and whatever problem they are calling about is a crisis, they simply don't have the time or the patience to deal with. Always apologize and if it is something that can be handled quickly, let them know that. If it seems more complex, repeat the problem back and lay out the plan of action to them including time frames if possible. They want the assurance that the problem can be handled effectively and without another call if possible. You don't know what caused the water works. If you work in banking or mortgage loans, it could be a serious financial problem. However, if you don't work in an area where you deal with high stakes, and possible high emotions, you could still encounter the occasional emotional meltdown because the problem they are dealing with on your call, is the straw that broke the camels back. I locked my keys in my car once and had a total meltdown on the phone with AAA. Too much was going on and that was just the last straw! When dealing with criers, like the Angry Alberts, give them a minute to vent. Speak to them in a calm, pleasant tone, getting frustrated or short with them will only make them worse. If it can be (and it usually can), let them know that solving their problem is doable. Give them the steps you'll take. If there is any action they need to take, make sure to have them repeat it back to you. Sometimes emotional people are so caught up in emotions that they don't hear you. Humans are emotional animals, dealing with their emotions ... and yours ... is part of the game. Our focus is often on the external customer ... the person across the counter or on the other end of the phone. We cater to them and rightly so, but we also need to cater to the customer next door, the one on the other side of the cubicle. While your interaction with a customer might be short and could possibly be a one-time occurrence, your interactions with your co-workers are on-going. Thus creating pleasant working environment with these 'customers' is critical. 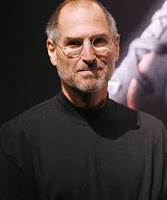 It is critical to your day-to-day level of job satisfaction and it is critical to the all-important external customer. We spend more time with co-workers than family, so even if work can't be a walk in the park, it shouldn't be a walk in a dark alley either. Work should be a pleasant, even if it's not a stress-free environment. You don't have to be best friends with your co-workers but you should have a basic level of respect and courtesy. You should be able to work together. Working with co-workers in a productive manner benefits the customer as well. You can work together to cross-train, solve difficult problems and just generally be of assistance. Separate Work and Home: While you are at work, focus on work, especially with co-workers. Keep the conversation light - movies TV, sports and don't be to quick to share personal details. Don't Gossip and Complain: Gossiping about co-workers is a big no-no, as is complaining about them. After all, the person you are gossiping with will automatically question your integrity. After all, if you would talk to them about a co-worker, what's stopping you from talking to another co-worker about them? Nothing erodes trust faster than gossip and complaining. Be of Service: Be available to help co-workers whenever you can. Do it because you want to and not because you are keeping score. A team is a team, you have your co-workers back and they have yours. Operate with Integrity: This encompasses everything that came before it and then some. When you operate with integrity, you will naturally refrain from gossip and be eager to help. You will also be honest and dependable - doing what you say you are going to do when you say you are going to do it. It also means taking your job seriously. When you are at work, you are at work. You arrive on time and leave on time. You don't take long breaks. Whether you realize it or not, people are walking you and your actions say more than your words ever will. If you are a manager, there are some things you can do to improve internal customer service. Be a True Morale Booster: If you want to show your employees you value them, then show them you value them. Jeans Days and donuts on Friday are short-term, shallow morale boosters. Look for other, more substantive ways to boost morale. Acknowledge jobs well-done. Share the credit. If you are going to give incentives, then ask your staff what incentives they'd like. Coach Don't Solve: Work with your employees on how to improve performance and overcome challenges. Do less telling and work with them to come up with their own solutions. Give them some autonomy and some leeway. Operate with Integrity: As a manager, this is critical. Managers set the standard. If you aren't trustworthy, your staff won't be either. You can't expect them to be prompt or stay late, if you consistently come in late and leave early. If you gossip, so will they. How will they take you seriously about teamwork, if they overhear you complaining about your team members. If co-workers are watching each other, they are definitely watching and taking cues from their managers.As Gandhi once said, "Be the change you want to see." Those little things can make the difference between a mediocre experience and a great one. I didn’t need a toothy grin and a whole lot of small talk, a simple, “Did you find everything?”, a total at the end of my order and a “Thank you” would have sufficed. Okay, truth be told, I could have done without the Sad Sack expression, I didn’t need a slap-happy smile but something a little better than the dead man walking expression could have been good. The little things mean a lot to a customer but they also can do wonders for the customer service rep. My first job was as a cashier at a supermarket. It can be a long, grueling, and thankless job. I’ve actually been that same cashier. I was miserable and probably made a few customers miserable (or at least annoyed). When I was the Sad Sack, my days were long and it seemed as if I had one bad experience after another. The time passed so slowly! However, I had a few co-workers who had another experience. They had irate customers, messes in their lanes and price-checks that took way too long, but they weren’t Sad Sacks. Their experiences were different. I decided to drop the Sad Sack and embrace a more positive attitude. All of those annoyances still happened but they weren’t so bad anymore. In fact, there were more positive people and experiences in my lane than I’d had before. Most importantly, time seemed to go by faster. It didn’t fly but it didn’t crawl or limp either. I think the more positive experiences I had were based, in part, on the fact that when I dropped the negatively, I also started investing more in the little things. I made eye contact and small talk. I said “Thank you” and “Have a nice day.” Basically, I connected with my customers. Did I connect positively with each and every one? Of course not, but I did connect with most and usually behind every negative or trying customer was a pleasant one. Sacking the Sad Sack made all of the difference. I am a cable customer. I have been with the same cable company for over five years now. Yet, on a daily basis, I see commercials for great deals my cable company is offering to new customers. Five years of faithful service obviously doesn’t mean much to them. I met a business owner who had the same philosophy. She had opened a new restaurant and was bending over backwards to court new customers. As a new business that made perfect sense. But, what about the customers who had found her business and started making repeat visits? What about us? When I proposed the question to her, her response was simple (rude but simple). She told me I didn’t know a thing about running a business. Funny, she’s no longer in business. As important as new customers are to a business, keeping existing customers is just as important. Customers can and do leave. I recently left a pharmacy that filled a difficult (and expensive) prescription for my dog. Marty is a toy poodle with Cushing’s disease. He’s too small to take a pill (even a scored pill) so his medication has to be mixed into a liquid suspension. It’s pricey. Over the last 18 months, the price has gone up three times with no notice. The first time represented a 27% increase and the second was a 33% increase. When I asked, after the second increase, for an explanation, there was none. However, I’d been a faithful customer so I don’t think anyone thought an explanation was warranted. After all, there are only so many local pharmacies that do what they do. Well, I called around and found a pharmacy that would do it for a lot less and they were exceedingly polite and customer-focused. Maybe they were so nice because I was a new customer, only time will tell. However, there are a few lessons to be learned. 1. I’m no longer a customer of the original pharmacy. They lost my business. After that first, and last, discussion on the reason for the increase, there was no further communication on my part. They will never know why I left. 2. I will leave the new pharmacy too if I don’t get the service and price I’m looking for. Will I tell them why I’m leaving? Probably not. I’ll just vote with my feet. 3. Most faithful and unhappy customers are like me. Loyal customers are often taken for granted but we will only be pushed so far. Many of us stay because it’s convenient and leaving would be a hassle. Yet, we all have limits; the pharmacy exceeded mine (the cable company is coming close!). Keeping ALL customers happy should be a priority. Retaining customers is just as important as attracting new ones. Customer Service work isn’t easy. In the face of downsizing, many CSRs that have survived the cut are facing increased workload and expectations. The job itself is stressful, but nowadays it’s even more so. So here are some tips for managing stress. Take Lunches and Breaks: You need that time to rejuvenate and recharge and it doesn’t take a lot of time to do either. To have a true break , you have to step away from your desk. Even if you just go to the break room, get up from the desk and take a real break. Photo Finish: It’s a clichéd customer service technique to keep a mirror on your desk to remember to smile. I say, have a family photo to remember why you are working so hard. Maybe even have a humorous cartoon or photo to remind you to keep things in perspective. Change your photos and cartoons every so often, so you don't get bored. Have a Talk: This one is tricky. Don’t necessarily talk about work (or co-workers) but at your lunch break talk to your co-workers about a favorite TV show or music. Talk, laugh, put a little fun into your breaks. Take a Walk: Smokers have the right idea. They go outside to smoke. I’m not saying you should smoke, but getting outside for even five minutes can make a difference. The Rear View Mirror: You don’t want to take your stress at work home with you. So at the end of the day, before you pull out of the parking lot, put on a favorite CD or radio station. As you head out of the parking lot and down the street, glance in your rear view mirror and notice your workplace getting smaller and smaller as it fades into the background. Your stress should go with it. Begin to turn your thoughts to: the music on the radio, the evening ahead, the rain on your windshield, … anything but work! Coaching is a two-way street but there is a lot more traffic coming from the CSR to the coach than from the coach to the CSR. In fact, during my coach training, we discussed that in a coaching session, the coachee should be speaking 80% of the time. That’s a lot of listening for the coach! Here’s how I conduct a personal coaching session. Before we begin a coaching relationship, I have an initial session where we discuss what the client wants to cover and what goals they want to achieve during our time together (usually three month increments). As for the individual session, we start by discussing last week’s homework assignment (more on this later). Next, I ask the client what they want to focus on this week. We spend the majority of the time discussing that topic. It is my job to ask questions and get the client to come up with their own answers. It is not my job to dole out advice or instructions. As I listen, I reflect the salient points back to the client, make observations, and give acknowledgement. At the end of the session, the client and I determine together what the homework assignment for the next week will be. Here is how I would tweak that for a CSR coaching session. Normally, there are goals already established for individual CSRs as far as productivity. However, as a manager or supervisor, you also know what each CSR’s strong points and challenging areas are. Your coaching sessions should incorporate both of those. If you don’t know what your individual CSRs strong or weak points are, ask them! I would send them an email and ask them for two to three strengths and two to three areas where they could use improvement. Ask them to send this to you at least one day before the session. Since they will, hopefully, be your employee for a long time, give a set time frame to work within. In other words, what will you focus on for each three or six month increment? Set goals that you will want to achieve during that time frame. It’s important that you set goals together. This isn’t you dictating what you want, you want more than just their input, you want them to drive this discussion. Discuss any homework from the previous week. This creates accountability. If you give an assignment and don't follow-up, very soon, your employee won’t take the homework seriously. Ask about successes or challenges from the previous week. Often times, you will find the subject for your session here, if not, ask what they want to discuss. If there is something you need to cover bring it up here. As you discuss your topic, let the employee do the majority of the talking. Offer your observations and any encouragement as you go along. At the end of the session, you can suggest a homework assignment or ask them what they think the homework should be. It’s important that you agree on an assignment. If the CSR thinks it might be too much (high work load or taking several days off), allow them to come up with a counter. Once the assignment is agreed upon, you will expect them to complete it and follow up on it. You focus on the what, let the CSR focus on the how. If you have a goal, let them control how they want to reach it. Don’t micromanage. Respect confidences. Coaching only works in an atmosphere of trust. 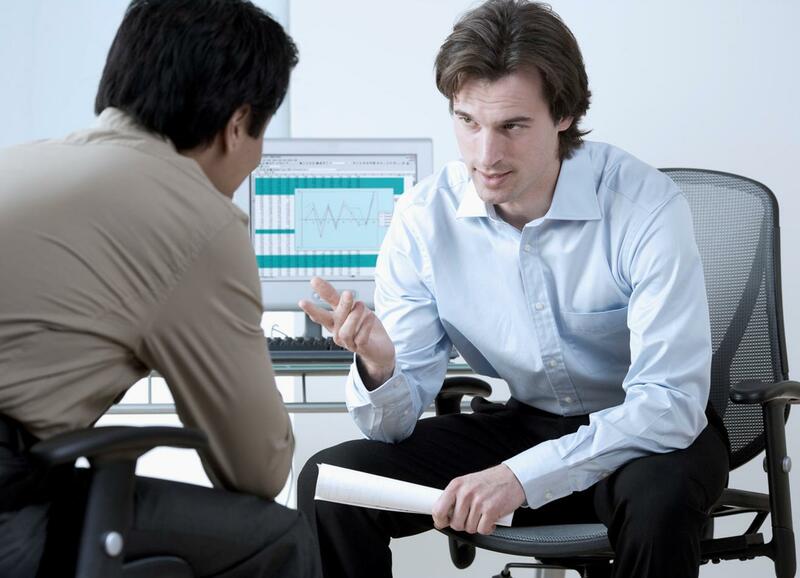 Do not share anything that occurs within a coaching session without the CSRs approval. Listen with intention. Be engaged. Make eye contact. Occasionally paraphrase what has been said to show that you are listening and hearing what’s being said. Be balanced. Offer criticism when needed but do it constructively and let them help determine what can be done to improve the situation. On the other hand, give credit and praise when credit and praise is due. Last week, I mentioned that I am a corporate trainer by trade. However, several years ago, I added life coach to my professional mix after earning my Core Coaching Certification from Coach Inc. Life coaching is usually a personal pursuit. 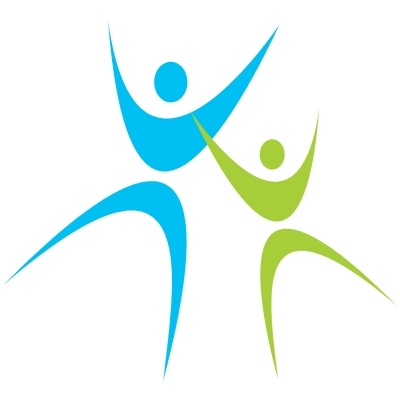 However, there is an entire arm of coaching devoted to business or corporate coaching. Be it personal or professional, a coach does the same thing for an individual as a coach does for an athlete or team. A coach helps create the plays, supervises the practices, and gives motivation and encouragement (or tough talk when needed). They get you ready to play the game. However, the coach is never the one to get out on the field and play the game. The coach prepares the coachee to play the game. In customer service, I feel there is a definite place for coaching and I've even seen companies that use the term 'coach'. However, I have seen very few companies use that word effectively. A coach isn't someone whose job is to tell you what you are doing wrong. A coach isn't an on-the-job therapist or a sounding board for a litany of complaints. A coach does address what can be improved but a true coach helps the CSR come up with things they can do differently or ways they can improve. A coach offers acknowledgement for things the CSR does well. A coach lets the CSR own their own successes and short-comings. Next week, I’ll give you some suggestions for how to conduct your own coaching sessions. As a corporate trainer, I have worked for and with a variety of call centers. One of my first post-college jobs was working as a hotel operator for a major hotel chain, so I can definitely emphasize with what most CSRs experience on a day-to-day basis. On the flip side, I’ve been a customer too and I know all-too-well, the difference between good and bad customer service. 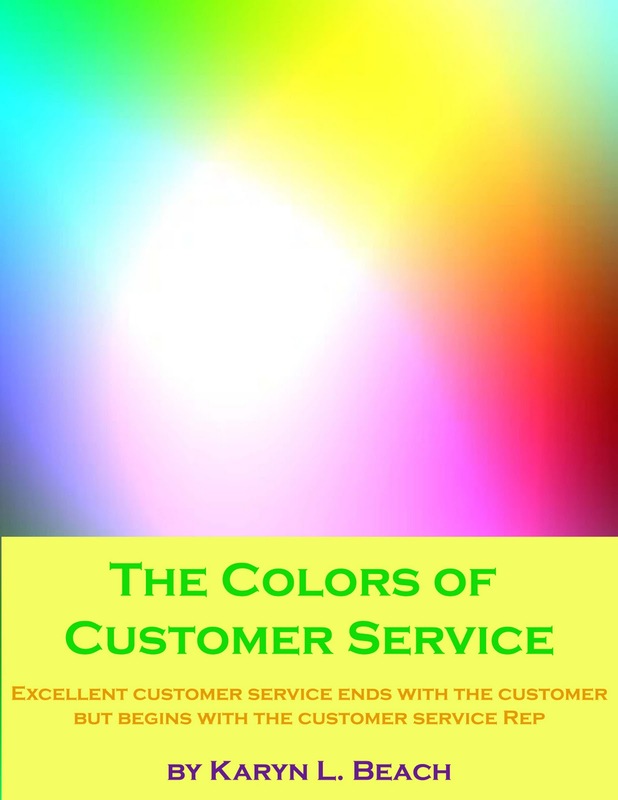 While working with a lot of the customer service materials, I was always amazed at the almost exclusive focus on the customer: what the customer wants, what the customer expects, what CSRs need to do to make the customer happy. That’s what I had to teach, but here is what I knew. Customer service representatives have one of the hardest jobs in any company. CSRs compensation does not reflect their importance within the organization. Levels of burnout are often high as much is expected of them and little is given. Surly, disengaged, or frustrated CSRs do not give stellar customer service. I couldn’t do anything about pay but I felt there was something I could do to address the burnout and disengaged issues. Most trainers will tell you a central component in adult learning is addressing the question, what’s in it for me? For adults, it’s not enough to sit in a class because they are supposed to. Adult learners need to know why they are there. What is the benefit? What will this training do for them? How will it help them? What will they learn that they can immediately apply to their jobs? 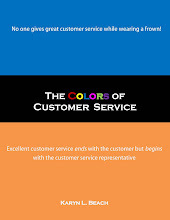 The Colors of Customer Service attempts to answer those questions. It hits on the usual customer service touch points about hold times, answering the phone clearly and the basics of effective listening … but it goes further. It addresses many of the CSRs day-to-day concerns. How to stay engaged when answering the same questions day after day. 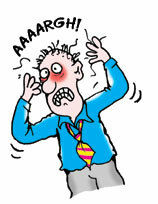 What to do to diffuse the residual emotion that remains after an irate caller. I decided to write it as a short business fable (a la Who Moved My Cheese? or The Energy Bus) I wanted it to be a quick and even fun read. Having survived years of academic text books, through high school and college, I learned the hard way that a dry reading experience isn’t usually the best educational experience! 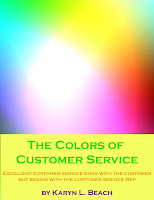 Currently The Colors of Customer Service is only available in Kindle, but I am working on a hard-copy version that should be available via Amazon by the beginning of August! I’ll keep you posted! You can smile over the phone. You can have perfect diction. You can be empathetic and a great listener but at the end of the day, you have to have integrity. By integrity, I mean honesty and follow-through. You need to say what you mean and mean what you say. Last week, I called to make an arrangement to pay a major bill. I wanted to create a payment via a post-dated check that would clear on June 3rd and not sooner. The woman I spoke to said that I couldn't do that. She suggested that I date the check for May 31. When I explained that the funds would not be there at the time, she told me not to worry because the check would take 3 to 4 days to clear anyway. Having done this before, I knew for a fact that what she was stating would not be the case. It would take one day, tops, for the check to reach my bank. We debated the point back and forth but I refused to postdate the check for a day when the funds would not be there. Since she was insisting on pressing the issue, I asked her to transfer me to a manager. After waiting several minutes, the manager picked up and I explained the situation. Yet before I could finish, the original customer service rep chimed in (I didn't realize she had stayed on the line) and denied everything she had said. I was livid. Keeping my cool, I reiterated our initial conversation. She denied it again. The manager was useless and had nothing to say. I hung up after refusing to deal with anyone who couldn't tell the truth. The next day I called back and had a completely different experience. I asked to date the check for the 3rd and was told to call back on the 1st because the postdated check had to occur in the same month. The person I spoke to knew the procedure and explained it to me. She didn't encourage me to do something that would have been detrimental to both parties - I would have ended up overdrawn and the company would have ended up with a returned check and returned check fees. Knowing the procedures is critical to good customer service. I didn't work for this company. I didn't go through their training. The CSRs did. I, as a customer, am relying on them to have the right information or at least know where to find it. Unethical behavior is never acceptable. Like most customers, I don't expect a CSR to know everything; but I do expect them to know how to find the answers.I do not expect to be mislead. I do not expect to be misinformed. I especially do not expect to be lied to. The customer service representative was wrong for lying and not explaining the policy accurately. The customer service manager was wrong for her lackadaisical and nonchalant attitude. The sad thing is that this was an entirely unproductive exchange. The original CSR wasted valuable time trying to convince me to do the wrong thing. She created a situation with escalating emotions and unneeded stress. She wasted my time and the manager's time in the process. She created a negative experience that I've shared with at least eight people before posting on this blog. The second conversation took a minute, two at the most, and I left satisfied that I had been provided with the correct information and the CSR moved quickly to the next call. What Do Customers Really Want? Get the CIA! We hear ad nauseam that the customer is always right. We also know that there are times when that isn't the case. I think the customer wants more than a "You're right." Here is what I think the customer is looking for. They want a friendly and courteous communicator. Friendly means that you are open and easy to talk to. It doesn't mean you have to have a 5-minute conversation about their day. It does mean that you sound interested and engaged in what they have to say. It means that even when they are abrupt or rude, you don't respond with abruptness or rudeness. Courteous means that you speak to them in a manner that is respectful and acknowledges their importance as a customer. It mean that you say "Please" and "Thank you". These are little things but they mean a lot to the person you are talking to. Friendliness and courtesy show the customer that they are valued. Finally, I said the customer wants "a friendly and courteous communicator" A communicator is someone who knows how to communicate effectively. It means repeating back and paraphrasing what the customer says to show them you are listening and listening is part of communication.Speaking clearly and using plain language (not technical jargon or slang) shows that you are speaking in a way they can easily understand. The customer has not been trained on company procedures. The customer doesn't have the software or the manuals or the policy guides. The customer doesn't solve company problems day-in and day-out. You do. The customer is relying on you to provide the correct information. I can think of one company in particular where I could call once and ask for information, hang up and call again, speak to someone else and get a completely different response. Same company. Same situation. Different information. This is unacceptable. The customer is calling and wants their situation resolved the first time. 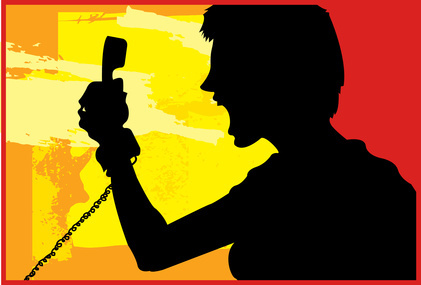 Repeated calls and different information is a recipe for dissatisfaction. Once you have the information, follow through, take the appropriate action. If you say you are going to do something, do it. Let the customer know exactly what steps are going to be taken and make sure, on your end, that those steps are taken. Do not make the customer have to call back regarding the resolution.